This poster is made by "John Gorham". I love his working process. I read his book that talk about his thinking processing. He talk about his unconscious area is the best source for creative IDEA. This poster is good example this story. 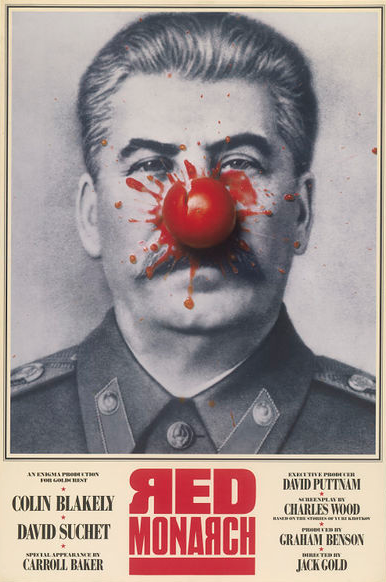 This poster is for "Red Monarch" that the black comedy about stalin. So he wants to express politics and comedy both in poster. This tomato that someone throw to dictator's face is solution this problem. 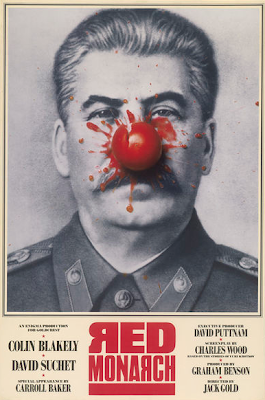 He can express "clown" and "dictator" both in ONE poster. I love wit in his work. And I think the best is creative idea in design too. 이 포스터는 "존 고엄"이라는 그래픽 디자이너가 만들었다. 나는 그의 작업 프로세스를 좋아하는데 그의 책에서도 말했듯이 그는 아이디어의 근원, 즉 그 방법론을 자신의 무의식에서 찾는다. 이 포스터는 그 좋은 예로 볼 수 있다. "Red Monarch"라는 스탈린에 관한 블랙코미디에 관한 포스터로서 그는 포스터에서 정치와 함께 풍자를 함께 표현해야만 했다. 독재자의 얼굴 포스터에 던져진 토마토가 이 문제의 해결책이 되었다. 그는 "광대"와 함께 "독재자"를 하나의 포스터에 표현할 수 있었다. 나는 그의 작업속의 위트를 좋아한다. 그리고 역시 디자인에서 가장 중요한 것은 독창적인 아이디어라고 생각한다.